Update: TechCrunch is weighing in on this too. What is Comcast’s argument? Comcast notes that using the Xfinity Xbox app won’t use up the 250 GB monthly cap (WHICH IS A LOT) because the content is not streamed over the internet, but instead is stored within Comcast’s hardware (much like OnDemand services). This seems to justify why data usage isn’t used with Xfinity, but is it fair that other apps use up the monthly data usage? To be frank, the 250 GB limit is A LOT. Netflix CEO said he used up 1 GB of cap by watching an episode of Saturday Night Live (which was probably an hour’s worth of data). Essentially, a person can watch 250 episodes of Saturday Night Live and barely reach the cap. Yes, many people use their internet for email, internet browsing and YouTube, but still 250 GB is a lot. 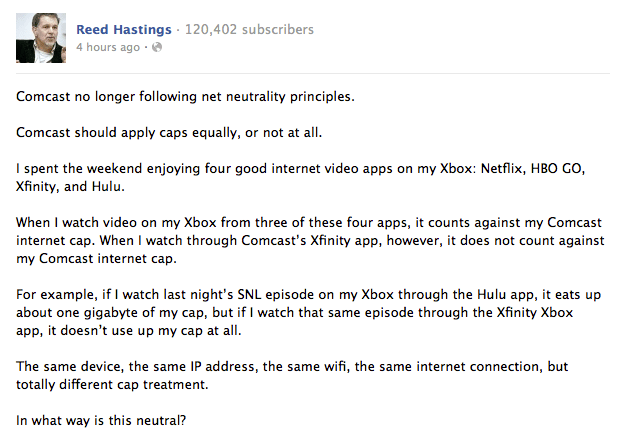 Now…aside form that, is it fair what Comcast is doing? I say YES! This gives Comcast the competitive edge and incentive to use their apps. Makes complete sense and is 100% fair. Comcast’s prices are high enough, customers would freak if this were not the case. It’s all about incentives to use Comcast’s app and to stick with their service. How can they deliver content faster and easier to customers? How can they use less data with their services? How can they offer more competitive pricing? Here’s some more information about the legalities of this subject.